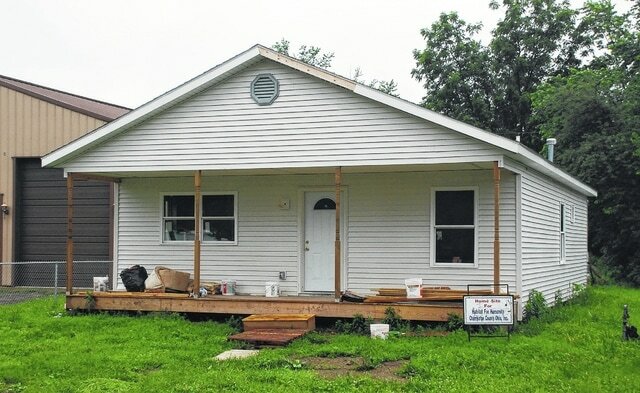 The city of Urbana, through funds received from the Moving Ohio Forward Program, demolished a nuisance home last year located at 247 W. Twain Ave. Pictured is a home being built on the property by Habitat For Humanity of Champaign County, which acquired the property in September 2014. Editor’s note: This is the second part of a two-part series on the process used by the city of Urbana to address nuisance structures. The process of finding a dilapidated structure to be in violation of the city of Urbana’s nuisance code is one thing, but acquiring the funds necessary to abate the nuisance, especially if that involves razing the structure, is another thing. Under the city’s nuisance code, if the director of administration determines a structure is a public nuisance through evidence provided by the city’s Nuisance Division, Champaign County Building Regulations and Champaign Health District, he or she has the authority to serve a notice to the property owner to abate the nuisance. If the notice to abate is not followed and the issue has passed through the legal process, the director of administration then has the right to carry out the abatement. In instances in which the abatement of a nuisance structure involves demolition, someone has to pay. Often, this means the city must come up with the funds. The price tag to demolish nuisance properties has ranged from $3,000 to $14,698 depending on a variety of factors. “If I go in tomorrow and say this house has been empty for 15 years and we are going to require the property owner to fix it up or tear it down, we have to have the funds in place in order to abate it,” Community Development Manager Doug Crabill said. While bigger cities often have funds dedicated to the removal of dilapidated structures, most smaller cities like Urbana do not. Between 2010 and 2014, the city used $215,765.82 in grant funding to demolish structures on 26 properties. In 2010 and 2011, 13 properties had structures removed at a total cost of $111,585.83, which was funded through grant money provided by the Neighborhood Stabilization Program (NSP). “NSP was basically CDBG (Community Development Block Grant) money that was designated by the federal government to this program,” Crabill said. In 2014, another 13 demolitions were completed citywide at a cost of $104,179.99, which was fully funded by grant money provided through the Moving Ohio Forward Program received by Champaign County. While there are no grants currently available for the abatement of nuisance structures through demolition, the city is in the process of razing a burned garage at 302-304 E. Church St., which has become a safety concern. “It’s a public nuisance at this point, and we don’t want kids in the neighborhood wandering into the garage,” Brugger said. Crabill added the city has used its standard nuisance process to address the issue. “The property owner has been non-responsive to complying with our order to demolish the garage and/or bring the garage up to code,” he said. Since nothing has been done to abate the nuisance, the city’s plan, pending council’s approval on the demolition expenses, is to raze the garage and recoup the costs from the property owner. “The property owner will have an opportunity to pay the city for its costs incurred to abate,” Crabill said. “If the city does not receive payment, then an assessment will be placed on the property. “We’ve requested quotations from three contractors, and these quotations are due back on Monday, July 6,” he added. Crabill said he isn’t aware of any new grant programs available for the removal of structural nuisances, but in the future, the city may be able to use CDBG funding to help cover some of those costs. Crabill went on to say, “CDBG has two objectives and one is to help low- to moderate-income folks. If it doesn’t meet that requirement, then it can be used for elimination of slum and blight. “So, you can use CDBG to remove dilapidated structures, but the challenge with that is there are certain federal laws about displacing residents of a home. So if a home is occupied, you have to relocate those people,” he added. As for the city possibly setting aside money in the future for the demolition of dilapidated structures, Brugger said, “The local government funds continue to be squeezed from the state level, so trying to get additional funds earmarked for these types of projects are challenging. We’d rather spend our funds on infrastructure and that type of thing. I’m not saying we won’t. We just have to look at those on a case-by-case basis. “We always try to put ourselves in the best position we can. (Demolition) isn’t something you can automatically budget for because you don’t know if you are going to have any or more than one in a year,” he added.